This cloth will give the ultimate finish to shiny surfaces, appliances and glass, as well as being effective at all light cleaning. It absorbs moisture fast and flash-dries to a streak-free finish. 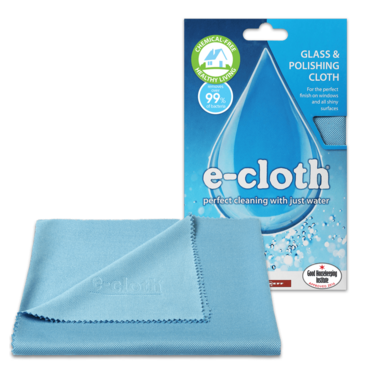 E-Cloth’s most versatile cloth, the Glass & Polishing Cloth’s specialist fibre construction and weave increase the speed at which moisture is absorbed, to remove light grease and finger marks from glass and all shiny surfaces, to leave them completely streak-free. It will easily outperform specialist liquid cleaners on surfaces like chrome and glass. I've been using this cloth for years to clean my mirrors. It cleans great and leaves mirrors streak free.It's also great for chrome and other shiny surfaces. I highly recommend it!